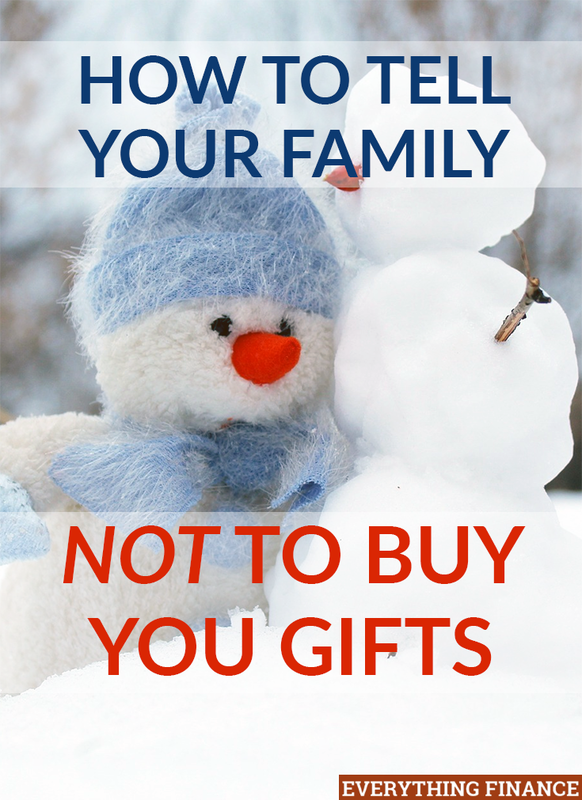 Family members have the best intentions in mind when they shop for gifts for your family during the Christmas season. However, if you’re like me, you might feel a little overwhelmed by how much stuff you already have. Maybe you feel the genuine desire to have a simple, clutter-free holiday season, or for people to spend money on individuals who are truly in need. Here are a few tips I’ve used to tell your family not to buy gifts, or to buy less gifts, this holiday season. Express your desire for family members to support individuals in need rather than buying you gifts. Some charity websites even allow you to make a wish list so you can share it with others. This doesn’t always go over well with some family members, and others might not want to hand over money. Another solution is to find a family in need in your community that you can bless (churches and schools are a great way to get connected to a family). Get that family’s wish list and share the list with your family members and include them in on the fun. Say something like, “I love everything you have blessed me with over the years, but I really want to give back to someone else who is in need.” Again, this might not go well with every family member, but it’s worth a shot if you feel strongly about it. Family members always want to buy my daughters clothes and toys. I’m so thankful for their desire to give, but we have too much stuff as is. I try to stress that we would love to be gifted experiences rather than gifts. I don’t know about you, but my daughter would love a special date with her favorite grandmas or aunties. It could be something as cheap as getting chocolate milk and a doughnut together, and she would be thrilled. When I was around 12, I remember my own aunt taking me out to lunch – just the two of us. It was such a special treat and made me feel like an adult because she spent the whole time talking and paying attention to me. Tell family members that this type of gift would be more meaningful for both of you and offer up some advice on how they could “wrap” it up for Christmas. Many people shy away from “experience gifts” because they don’t know how to translate it to an actual, physical gift for the child to open. Despite your best efforts, family members will still shower you with gifts. Don’t get upset by it, but instead feel blessed. I’ve learned to be grateful for each gift given, knowing it’s out of love. However, I’ve also learned to only keep what works for my family. I’ll either make room to fit it into our life, or return it or donate it to someone in need. If my daughter receives five new outfits this season, I’ll donate five old outfits that are worn out or that she’s close to outgrowing. However, if one of the outfits isn’t something I would ever dress her in, I won’t feel guilt over donating it. How do you handle family members who love to give during the holiday season? I don’t know if I have the courage to say this to family members as I want to receive Christmas gifts. That said, I think I could pick those closest family members whom they could give something to charity than giving it to me. That would be extra meaningful, perfect for Christmas. I just told my parents that they shouldn’t buy gifts for me as I am now employed. I am planning that it’s my turn to give more gifts to them. They are really fine with it.